Lake Casa Blanca International State Park lies on the Western Rio Grande Plain. The rock layers in the park are sandstones and mudstones of the Laredo Formation. These date to the Eocene Epoch, about 38 to 54 million years ago. Gravel from the Pleistocene Epoch (about 11,700 to 2.6 million years ago) covers large areas of the park east of the lake. Many of the rock outcrops in this area consist mostly of fossil oyster shells. Oysters lived here millions of years ago when the area was an estuary, or a waterway where ocean tide meets river current. Lake Casa Blanca International State Park was once part of a coastal swamp. 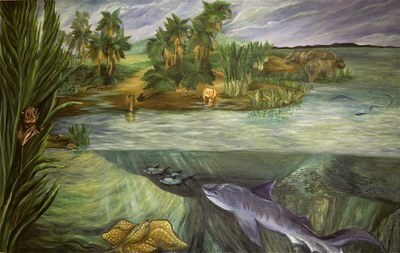 Painting by A. Salazar. Some 42 million years ago—after dinosaurs went extinct but long before people walked the earth—this was a very different place. Warmer temperatures meant higher sea levels, so this area was actually on the coast. Dr. Jim Westgate and his students from Lamar University have dug up a treasure trove of fossils here since the 1980s. Based on these fossil finds, Westgate has described what life in this area was like millions of years ago. Fossils show that this was once a coastal swamp with low-lying forests and dense stands of Nypa mangrove trees, the only known Nypa mangroves on our continent. It was not at all like today’s arid environment. Because of the lush environment, a large number of species co-existed here. 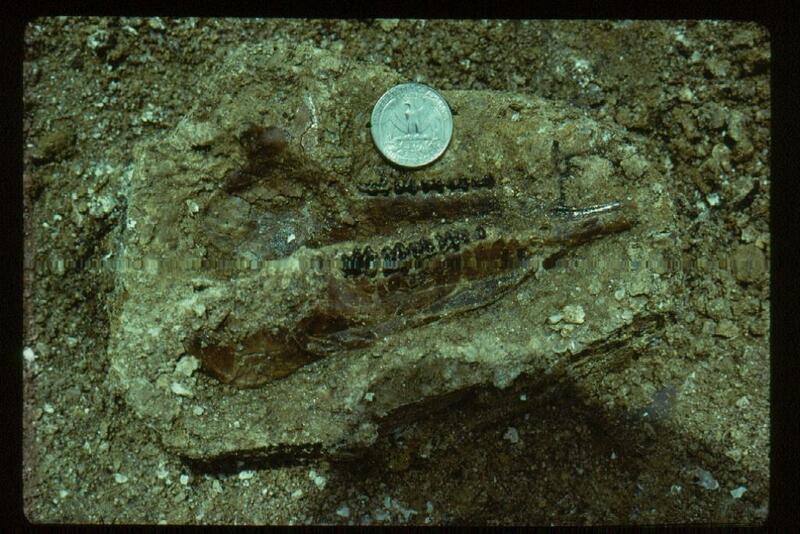 Westgate and his students found fossil remains of 29 extinct mammal species. Lower jaw of four-toed horse. Photo by James W. Westgate. One of the mammals was the tiny Epihippus gracilis, the last of the Eocene four-toed horses. Tarsiers, a tiny relative of humans and apes now found only in Asia, lived in the jungle canopy here at one time. Other remains include those of a hippopotamus, a “sea snake” which might have been 20 feet long, and various sea creatures. Look for a display on the park’s fossils at headquarters. You can also obtain Dr. Westgate’s book, “After the Dinosaurs,” there for a small donation. Lake Casa Blanca hosts both migratory and year-round bird species. You will find typical monte (brush) species year-round along the hiking trails. These include vermilion flycatcher, golden-fronted and ladder-backed woodpeckers, cactus wren, pyrrhuloxia, mourning and white-winged doves, Couch’s kingbird and greater roadrunner. Summer residents of the park include Bullock’s and hooded orioles, scissor-tailed and brown-crested flycatchers, and western kingbirds. The fall and spring migrations bring a variety of warbler species, vireos and flycatchers. Green jays and great kiskadees live here year-round. Lark sparrows are frequent in the summer, while winter brings other sparrows such as Lincoln’s and grasshopper. The lake provides habitat for wading birds such as great blue heron, snowy egret and great egret year-round. American white pelicans and various waterfowl (such as northern shoveler and blue-winged teal) make their homes here in the winter months. Many interesting water birds live in the unique wetland on the park’s northern border along Ranchito Road. These include black-crowned and yellow-crowned night-herons and a variety of wintering waterfowl like bufflehead; ring-necked duck; lesser scaup; blue-winged, cinnamon, and green-winged teal; gadwall; ruddy duck; and northern shoveler. 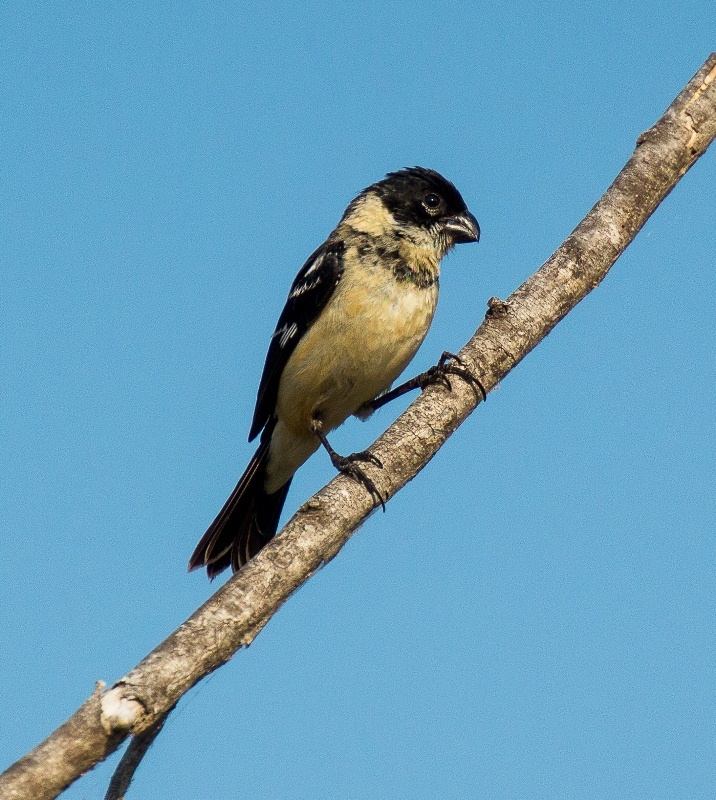 White-collared seedeater. Photo by Raul Delgado. The tiny Morelet's seedeater is the park’s most prized bird. The seedeater is easiest to locate during its breeding season, May through September. Park staff will lead tours to look for seedeaters by request. We offer regular bird walks. Check our Events page for upcoming walks, or contact the park office to arrange a private bird walk or tour for your group. Please do not play bird recordings in Texas State Parks, as it disturbs the birds. To find out more about the birds listed above, visit All About Birds. You are likely to see black-tailed jackrabbits and eastern cottontails in the park, as well as white-tailed deer. Other mammals that live in the park are javelina, bobcat, skunk, raccoon, opossum, Mexican ground squirrel and various species of bats. Snakes are more often seen in the park during warmer months. Western diamond-backed rattlesnakes live here. So do the Schott’s whipsnake and the non-venomous diamond-backed water snake. Lizards often sun themselves on rocks in warmer months. Greater earless lizards and Laredo striped whiptails are seen frequently. The whiptail is unique because it uses parthenogenesis to reproduce. This means that every lizard is a female, who only gives birth to females. Two species listed as threatened have been sighted in the area: the Texas horned lizard (in the park) and the Texas tortoise (nearby). 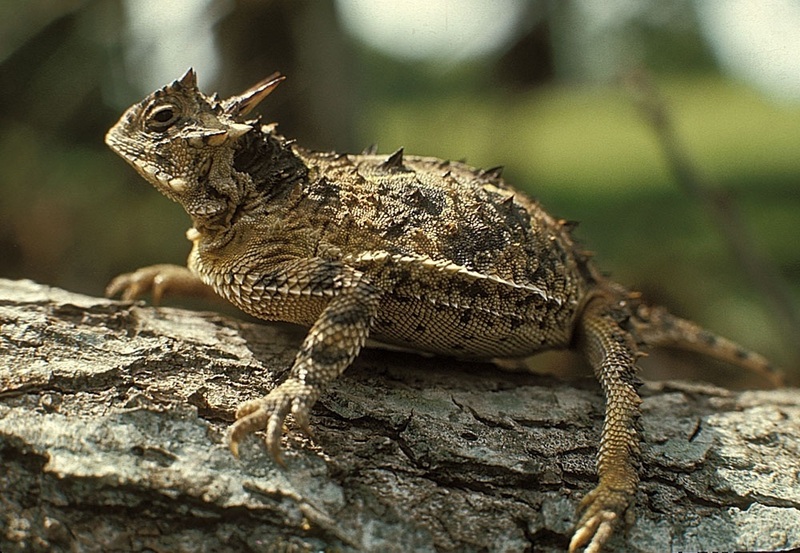 Of course, the Texas horned lizard or “horny toad” is our state lizard! We protect these species (and all plants and animals in the park); they may not be disturbed or removed. Spiny softshell turtles and red-eared sliders are the most common turtles seen in and around the lake. Rio Grande leopard frogs appear after heavy rains. Just for kids: Vanishing – why are some animals disappearing? Fishermen will be happy to know that many crappie, largemouth bass, black bass, hybrid stripers, catfish, perch and non-native tilapia populate the lake. You can fish from the bank, the pier or from a personal boat. Remember, you do not need a license to fish from shore within a state park. However, you do need one to wade fish or fish from a boat. Learn more about fishing here on our Fishing Tip Sheet. A variety of butterflies visit the park. In late winter and early spring, red admirals are common, especially around larger willow trees by the water. The aptly-named American snouts, with long “noses,” migrate through in the thousands during the warmer months. You can see pipevine and giant swallowtails as well as queens, which are very similar in appearance to monarchs (also found in the park). Of course, these species are just a few of the many that you can spot here. Don’t be surprised if you scare up one of the enormous black witch moths from its hiding place in the brush. These dark brown moths are the size of a man’s hand, but despite their startling appearance, they are harmless. Learn more about the Butterflies and Moths of Webb County. Keep Texas Wild: South TX Plains (TPWD Video). 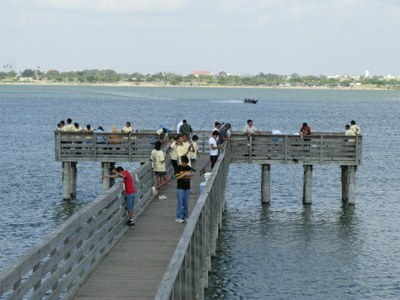 Lake Casa Blanca International State Park lies on the western edge of the South Texas Brush Country. This area is known for its distinctive low-growing woody plants. But 300 years ago, it looked very different. Over the years, people and animals transformed the South Texas plains from wide open grasslands to the brush country of today. Early European and American settlers saw the grasslands as perfect for grazing cattle and sheep. But over time, fire suppression and overgrazing destroyed the grasses. Livestock spread the seeds of brushy plants, and those plants quickly took over. Today, the plant landscape in the park is primarily Tamaulipan thornscrub. Some Chihuahuan Desert plants creep in, too. 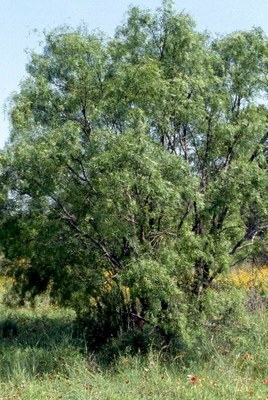 Plants typical of the brush country include honey mesquite, guajillo and huisache. Blackbrush, whitebrush and soapbush also grow here, as well as desert and sugar hackberries and willows. Texas’ state plant, prickly pear, is abundant. Other cactus species, like horse crippler and fishhook, grow here as well.